Care Home residents run away to the circus! This pioneering project championed cutting edge arts in care homes. Clowning, magic, juggling and acrobatics are just some of the skills that care home residents from East London were invited to try as part of the ground-breaking performing arts residency programme. 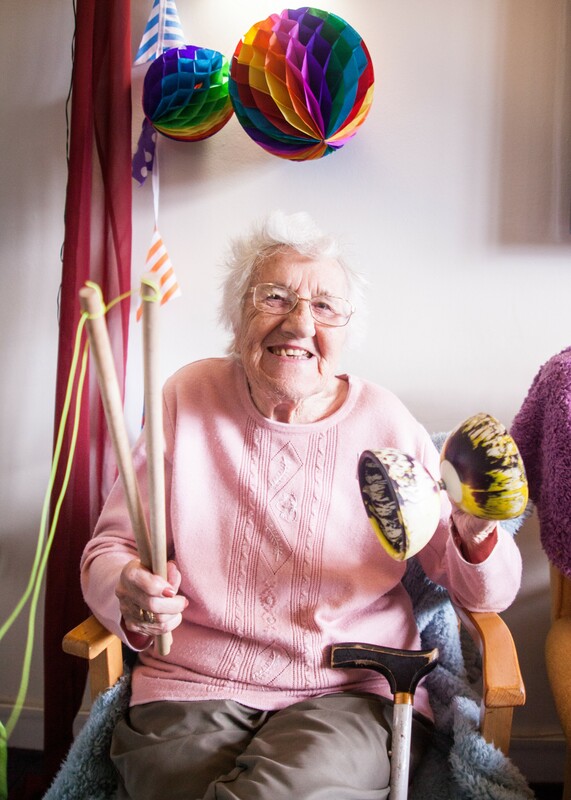 Supported by intergenerational arts specialists Magic Me leading contemporary circus and aerial theatre company Upswing brought their innovative participative circus skills to a care home for the very first time. Upswing’s 10 week residency at Silk Court care home in Bethnal Green was part of a two year programme of performing arts residencies in care homes led by Magic Me, hosted by award-winning housing providers Anchor and funded by the Paul Hamlyn Foundation, Anchor’s Legacy Fund and the Wakefield and Tetley Trust. The ground-breaking programme supported some of the UK’s leading performing arts companies in developing their work and practice for a care home audience including those with dementia. Our circus practice goes beyond coming into the home to entertain or deliver an activity, we want to see circus as part of everyday life at Silk Court Care Home by giving staff and residents new playful ways to interact and a new perspective on each others abilities. Upswing’s residency started in September 2016 when they worked with care staff and residents – introducing them to acrobatics, juggling, magic as well as working with a musical composer to put the final touches to the group’s artistic offerings. Upswing and our other project partners are leaders in their fields. This project demonstrates to the arts sector that performing for care home audiences, including people with dementia, doesn’t mean diluting or dumbing down your work. The companies who have taken part so far have found it to be a joyful experience and a creative catalyst in making their work even more accessible. Care Home residents, especially those living with dementia are often a forgotten part of society. 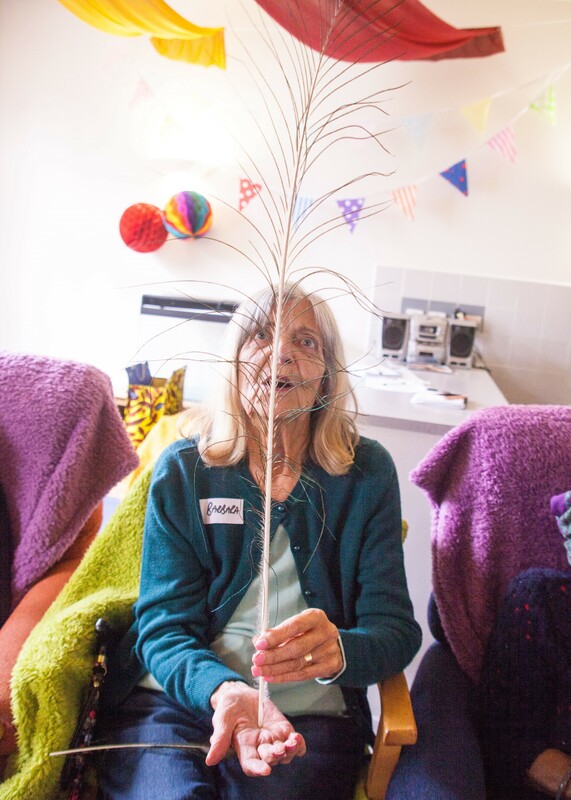 This project is an important addition to Anchor’s person-centred activities programme and shows that care homes are exciting, creative communities. We hope it will encourage other artists and companies to consider developing their work with care homes. We are passionate about bringing new experiences to people whatever their age. An understanding exists of the ability of circus to empower young people and to help them achieve beyond their expectations. We want to demonstrate that the same impact is possible with the residents and staff at Silk Court Care Home showing that at any age we can still surprise ourselves and have fun at the same time. A celebration of this project will be took place on Tuesday 15th November at 2:30pm. Research from the first phase of the Artist Residencies in Care Homes programme sharing the experiences of immersive theatre company Punchdrunk Enrichment and performance artist Lois Weaver was published in June 2016 and launched at Queen Mary University of London. This report can be read and downloaded here. The full project report documenting the experiences of all four participating companies (Punchdrunk Enrichment, Lois Weaver, Upswing and Duckie) was published in April 2017. You can listen to the podcast of the report launch here.